Childhood memories can be a tricky thing. And certainly hard to back up in the absence of corroborating evidence. I still know people who swear they saw scenes with Luke and his friend Biggs on Tatooine when they saw Star Wars in the theater, despite the fact that those scenes were never included in release prints of the film. So when I would tell people about my distinct memories of watching Night of the Living Dead for the first time when I was a kid, I was never surprised to be greeted by skepticism. Growing up in the pre-VCR era, it was standard practice to review the TV Guide each week to look for movies and TV shows we were interested in, so we'd know when we'd need to be in front of the TV. My introduction to Night of the Living Dead came through my older brother, who promised that the film was scary — even in the daytime! Had he told me about it before the fateful day where it turned up in the TV Guide with a listing indicating that it would be airing at 11:30pm on Channel 2? That I honestly can't remember, but I do know this — seeing Night of the Living Dead was an occasion unlike any other that had come before. In the days leading up to the night it was on, we asked and received permission to set up sleeping bags to watch it in the den on our family's color TV (we had a small black and white set in our shared bedroom). That night, after we had made all our preparations, I was quite surprised to find when the film started, as the car drove up the road to the cemetery, that it was in black and white. As a result, my brother and I were sent to our bedroom to watch it, since there was no point watching it on the color television. I’m sure I was disappointed, not only that we weren’t able to watch it in our sleeping bags, but also because the film was in black and white; which all but guaranteed that it couldn’t really be that scary. Could it? The remainder of the film was watched from the safety of my bed, on the small black and white television set in our bedroom. And yet it captivated me from start to finish. Right down to the final, unsettling finale that no prior monster movie I had ever seen had prepared me for. When it was over, I recall looking over to my brother, only to see that he was fast asleep. Though it was now 1:30 in the morning, I was keenly aware that the responsibility lie with me to go to the TV, turn it off, and then try to make it back to the safety of my bed—in the dark. I knew the station would soon go off the air for the broadcast day, filling the room with the hiss and glow of static that a few of you may affectionately remember as ‘snow’. 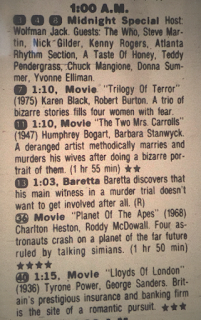 Fortunately, I was aware (from the initial search of that week’s TV Guide) that Planet of the Apes was airing on Channel 36 starting at 1:00am. So I made a mad dash across the room to the TV set, clicked the dial from VHF Channel 2 to UHF Channel 36, and made it back into my bed in time to see our intrepid astronauts' water landing in the Forbidden Zone before falling fast asleep myself. From that day forward, whenever I talked about Night of the Living Dead, which had instantly become (and has since remained) my favorite horror film of all time, I would tell the story of that first viewing. But I could never pinpoint my age when I first saw it. I always associated the film with Creature Features, our weekly monster movie show hosted by Bob Wilkins, because I had clipped and saved an interview with him from our local newspaper supplement where he stated that Night of the Living Dead was one of the most frequently shown movies on the program. Though the film stuck with me, my recollection of it did not specifically include Bob, which would become a very important detail, 40 years later. 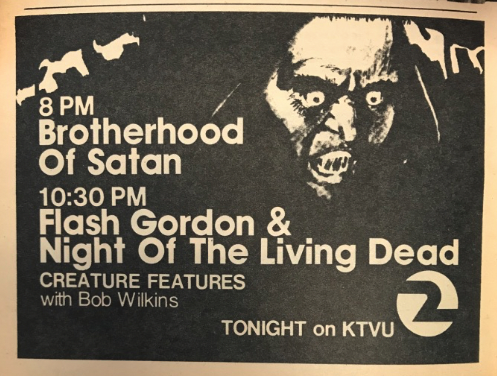 As fate would have it, Monster Kids in the Bay Area of Northern California had a great deal of affection for Bob Wilkins and Creature Features. Much was written about the show and its host through the years. There were frequent convention appearances, and some enterprising fans started the laborious task of documenting every film that aired on the show. I was able to rule out the first five listed airings, as they were all started earlier than I had distinctly remembered. But I still had a ways to go to determine the date on which I had seen the film for the first time. 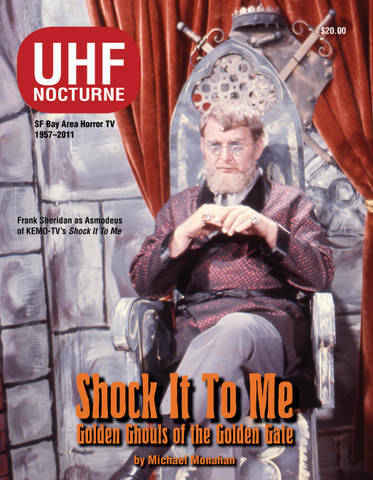 Around the same time, in 2011, Michael Monahan published Shock it to Me: Golden Ghouls of the Golden Gate, which focused on Bay Area Horror TV from 1957-2011. 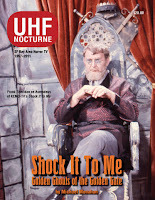 Monahan had researched the films that aired not only on Creature Features, but on other shows throughout the Bay Area. His research relied heavily on the listings in the San Francisco Chronicle (via microfiche). Let me take a moment to say that despite exhaustive research, the information you uncover is only as reliable as the source. In my own investigations, I discovered that checking multiple sources (physical TV Guides, these published accounts mentioned above, and microfiche of other local papers - such as the San Jose Mercury News) can yield different results. Short of finding someone who kept a log of what actually aired at the time, we must take everything with a grain of salt. I am generally confident with the data I have collected, considering that for the most part there are at least two sources of corroboration - but I know some assume the published scheduling information might have been wrong across the board - which I acknowledge. Unfortunately, while Monahan’s book was a godsend, it couldn’t include every horror/sci-fi/melodrama that aired through the years, so a 1:00am airing of Planet of the Apes wasn't included for me to cross-reference against the Night of the Living Dead airings I was now aware of. The only way I was going to get the missing data I needed was to start tracking down the physical TV Guides in question. A word of warning to anyone who considers going down such a rabbit hole. Finding TV Guide back issues isn't particularly difficult, particularly if what you’re looking for is the cover story, main articles, or crossword puzzles that are present in all national copies. When you’re looking for local programming, however, bear in mind that there were editions published for locales throughout the country, which meant the only ones of value to me were the San Francisco Metropolitan editions. It makes for a much more challenging quest, since that information isn't often listed. I did decide to go all out and track down all of the local issues that included a Night of the Living Dead airing, but what I really wanted to find was the one issue that would also have the Planet of the Apes listing on Channel 36 the morning after Night aired; pinpointing the exact date I saw the film for the first time. The aforementioned Tom Wyrsch kindly provided me with a number of the back issues I needed, part of a collection he had assembled in order to publish a book of display ads for Creature Features that ran in the local TV Guide. A few others were acquired from friends with an extensive collection of back issues, though I quickly discovered that most of their inventory had already been exhausted by none other than Tom as he was doing his research. That meant I had to rely on eBay to find the rest. And it was slow going. One by one, a local edition I needed would turn up. And each time a newly purchased back issue would arrive, I wondered if it would be the issue that would finally provide the answer to my search. Sadly, with each new issue received, I was disappointed to find that it was not. Once I was down to needing one final issue (May 10, 1975), I was sure that through the process of elimination I had isolated the date (despite the reported air time not aligning; I assumed this must be another inconsistency that the TV Guide would correct). I still wanted to have the physical copy to confirm my suspicion, but it was months before one turned up on eBay. When my copy finally arrived, I felt like I had just opened the Ark of the Covenant only to find sand. The listing for Planet of the Apes wasn’t there. At this point, my wife and friends who had long been aware of my quest were convinced that I had misremembered the series of events. I had little to offer to suggest otherwise. 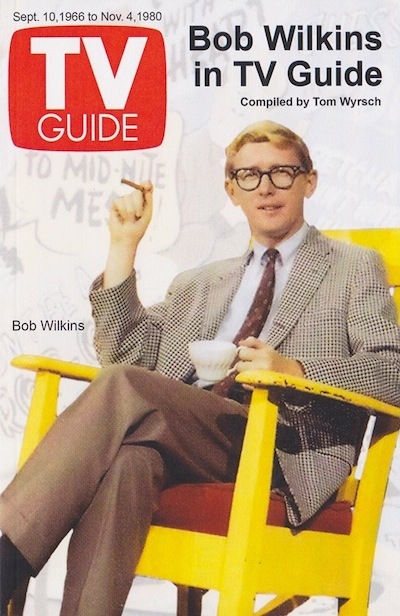 As I re-lived that first night over and over in my head, one thing I realized was that I didn’t specifically recall Bob Wilkins introducing the film, or appearing between commercial breaks. I had initially written that off as my memory of the film overshadowing such details, but it sent me back to Monahan’s book to see if I could find anything else that might be enlightening. As I reviewed all of the other shows that aired in the similar timeframe, I came across a listing for Night of the Living Dead on a Saturday afternoon in 1974, on an unhosted show called Chiller Diller. While I knew the Saturday afternoon airing wasn’t the time I saw it, it did dawn on me that it may have been the first time my brother saw it, which would also explain his comment (that I had never thought to question) that the film was scary — even in the daytime. 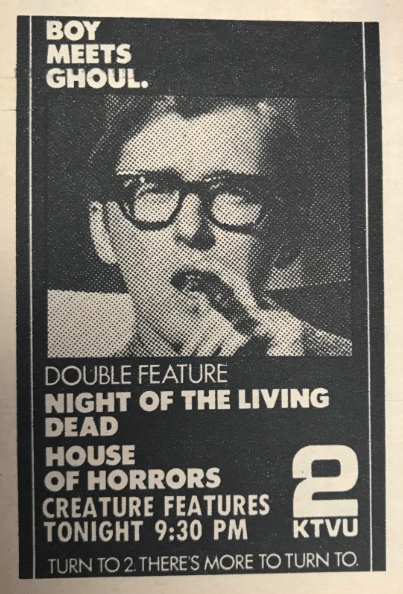 In reviewing the rest of the listings in the Monahan book, I soon discovered there was in fact another Night of the Living Dead airing I had previously overlooked: a Friday Late Night edition of Chiller Diller. After all these years, might I have finally found the date I had been searching for? 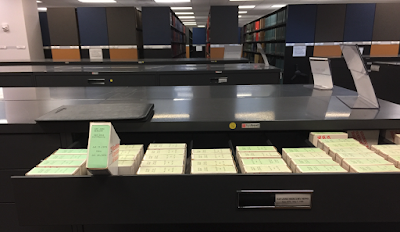 Rather than wait to find a physical copy of TV Guide, on November 15, 2017, my wife and I went to the San Jose Public Library to review the Mercury News microfiche for the date in question. I found the roll corresponding to the date, loaded it up and started scanning. I quickly arrived at 11:30pm, and found the following listing for Night of the Living Dead. Radiation leak? And only two stars??? 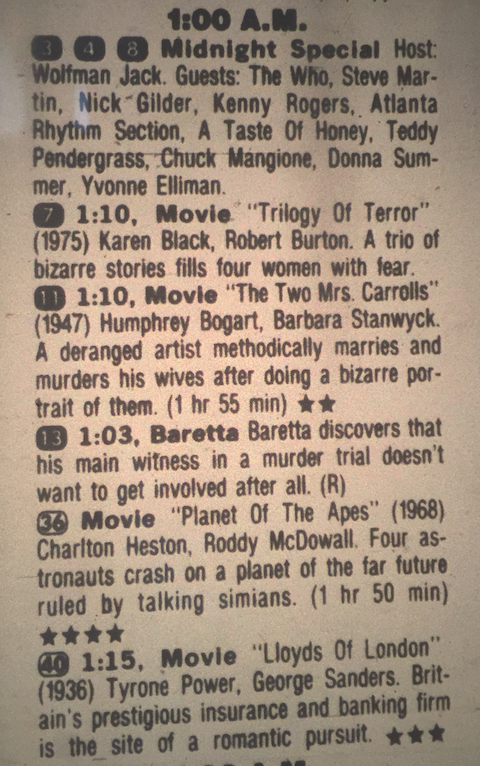 I scrolled down to 1:00am and the first thing that caught my eye was that Trilogy of Terror was airing on Channel 7, meaning that I might very well have doubled down on the horror had I switched to that, instead of Planet of the Apes, which was listed below it on Channel 36. My search was over. After more than a decade, I had finally identified my first Night of the Living Dead: 11:30pm on Friday, July 13, 1979, when I was 9 1/2 years old. I now have a date that I can celebrate annually, and will surely never forget as it was not only Friday the 13th, but July 13th happens to be the birthday of my good friend David J. Schow (who we've determined was probably in a Hollywood theater watching Dawn of the Dead that very night). I have since picked up a physical copy of the TV Guide for that airing, and was similarly surprised to see that earlier in the week, The Omega Man had aired on Channel 5. While I don’t know for sure, it’s possible that it might have been the first time I saw that film as well, which would provide an interesting spiritual proximity between the 'official' adaptation of Richard Matheson’s novel I Am Legend and Night of the Living Dead—before I was even aware of the book’s existence. Since I went the trouble of tracking them all down, I felt obligated to include a gallery of all of the Bay Area TV Guide listings for Night of the Living Dead. It's also interesting to note the order in which the actors get credited (the total number credited clearly depending on column space available), and whether or not the roles the actors played are noted. 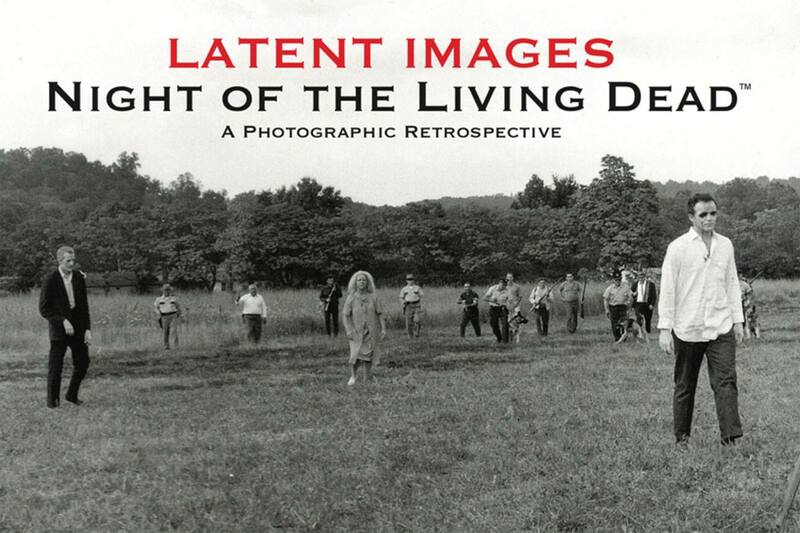 I find myself writing a lot about Night of the Living Dead this year, as we celebrate the film's 50th anniversary. 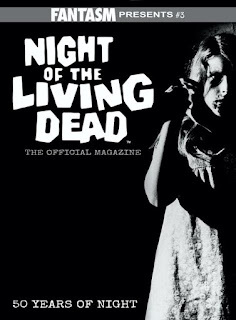 For more of my Night of the Living Dead ramblings, check out my article "Born of I Am Legend" in Fantasm Media's 50th anniversary magazine, 50 Years of Night, where I detail how George Romero became acquainted with Matheson's inspirational novel. 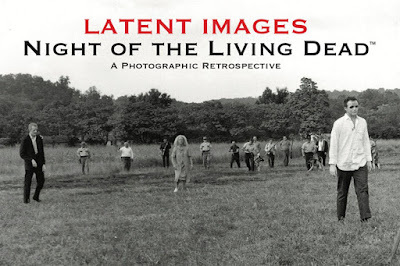 And please head over to Dreams and Visions Press to sign up to receive email updates on my forthcoming coffee table book of photographs from the making of Night of the Living Dead: Latent Images. It will be a 10" x 12" hardcover containing at least 128 pages of black and white and color behind the scenes photos, including many rare and never before published images, under license from Image Ten, Inc. The book is due out early next year. Special thanks to Tom Wyrsch, Jim and Melody Rondeau, Blog Wilkins, and Michael Monahan’s book Shock it To Me, all of which were indispensable in my quest to track down the date I first saw Night of the Living Dead. I love it! I can't imagine there are that many of us who have spent hours and hours over the decades hunched over microfilm readers (microfiche's less-convenient older brother) looking at old TV listings. I always found that the daily newspaper listings were more reliable than those in TV Guide for the simple reason that they were done closer to the event. Boy, I wish someone would digitize the old TV Guides, not so much for the local listings but for the national listings and all of those breakout boxes that highlighted special shows. Thanks, Jack! It's a fun experience in time travel to go flip through the old physical TV Guides - to see the ads, the promos for the popular shows, the big network premieres... plus the capsule reviews for the shows in syndication - which they had room to list because there weren't hundreds of channels to choose from! That said, I'm extremely jealous of those folks whose local papers are digitized and available online. The microfiche experience can be a fun one (akin to threading the 16mm projector to watch a film), but there's something to be said for being able to do a quick keyword search and have all the results right at your fingertips! Great detective work! Makes me want to find out exactly when I first saw Creature From the Black Lagoon (or Revenge) for the first time. That would have been the first horror/sf flick I ever saw in 65 or 66, late on a Saturday night, on KOVR. Have I given you enough info, John? John, I can’t tell you how deeply, or in how many ways, this post resonated with me. Even setting NOTLD aside for a moment, your immensely readable reportage reminded me of both my contemporaneous youthful Creature Features viewing---although our New York-area incarnation was somewhat different---and my own efforts at novelistically recounting same on my blog. The 3x5 index cards I used to document my viewing of genre films in that era (complete with “Shocker about a plague of zombies loose in Pennsylvania” TV Guide clipping attached) confirm that my own late-night first viewing, on our local ABC affiliate, came a scant 29 days later on August 11, 1979. But your herculean efforts to nail down yours put me to shame. The first time I saw it uncut a few years later was also a big deal, when a co-worker at the fast-food joint where I was working that summer agreed to go in with me on a rental. Back in those days, you didn’t just rent the videotape, you had to rent the whole damned VCR along with it, since we didn’t all own those yet. It was as big as a tank and had to be hooked up before we could watch the tape. Funny coincidence about the (almost inevitable) Matheson link, BTW. So, Happy Birthday, NOTLD, and great job on bringing it all back. Thanks, Matthew! It is amazing to compare notes all these years later and be reminded how many of us had similar experiences growing up. I think I"ll have better luck finding a copy of THE LAST MAN ON EARTH with the onscreen title THE DAMNED WALK AT MIDNIGHT, since there are at least film prints of that in circulation (http://monsterdad69.blogspot.com/2012/07/my-humble-contribution-to-imdb.html)! Gadzooks! Something else the author of Richard Matheson on Screen SHOULD have known about, but didn't. Monster Dad (presumably a former Monster Kid) sounds like my kinda guy.